Hola. Bonjour. Ni hao. Hello. How many of these greetings do you recognize? Do you speak more than one language in your home? Does your child? Increasingly, the answer to that last question is ‘yes’. Dual language learning is on the rise in much of the world, and that’s a great thing. Research has demonstrated conclusively that learning two or more languages concurrently has multiple benefits. Improved “executive function” (EF): Like an air traffic controller, EF helps you to identify, plan and order the steps to reach a specific goal, to focus, and to keep multiple pieces of information in mind simultaneously. Using and switching between multiple languages is like an advanced training course in executive function, which helps with a number of school-related tasks (think: reading, math). Enhanced divergent thinking: The ability to generate multiple ways of solving a problem improves when a person knows multiple languages. Health benefits later in life: Research shows that lifelong bilingualism may contribute to delayed onset of Alzheimer disease. Emotional benefits: For children who leave their native country for a new one with a different language, bilingualism allows them to experience a sense of belonging to both the old community and the new one. Understanding traditions and customs will also be easier if they are able to speak and understand their native language. A child’s ability to become fluent in a language is at its highest when she is exposed to it from the beginning, starting in the first few months of life. 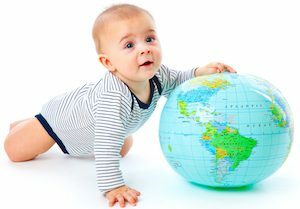 In fact, according to Patricia Kuhl, babies at 7 months of age have a remarkable ability to differentiate sounds from any global language. By 12 months their ability to understand their own language has improved, but their ability to identify unique sounds in other languages has decreased significantly. Does this mean you have only a 5 month window to teach a baby a new language? Absolutely not. But it does mean the earlier you consistently expose your child to a second language, the better. It’s never too late, of course, though the learning curve does get much steeper after age 7. Not only is timing important, but the quality of the interactions matters. A baby’s ability to learn a second language decreases significantly if the exposure is via a screen (e.g., television or computer) vs. an in-person interaction. Above all, value in-person conversations where your baby can watch your mouth, your tongue, your face while you (or others) communicate. This will help them pick up cues faster. How can I help my child become bilingual? One parent, one language: under this strategy, each parent should stick to one of the languages permanently. Results are best when the approach is consistent (no flip-flopping languages) and the baby is exposed significantly to each language independently. One at home, one outside the home: in this strategy parents stick exclusively to the foreign language at home to provide a solid base. Outside the home, the local language will be learned, usually at school. Read to their child. Reading children’s books in the second language is a simple way to practice together, since the illustrations are often linked to the story and the vocabulary is not too complex. Finding bilingual “first word” books is a great start! Expose their child to native speakers. When you think about babysitters, look for one who is bilingual. 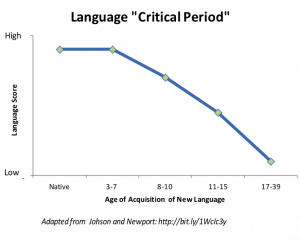 Or if you are considering a daycare or pre-school, ask if they support non-native language growth. Look for second language programs in your area: many libraries and other organizations host frequent events like book readings or playgroups to support the exposure of children to a second language. Regardless of how you introduce another language, know this: Your child’s first language learning will not be harmed. In contrast to the ‘old school’ thinking that learning two languages might somehow delay the progress of a child’s first language learning, we now know that children’s brains are far more capable about balancing both than we used to give them credit for. Sure, there may be an occasional instance when your child has to pause and think about which word she needs, but at the end of the day, her second language learning will be a huge advantage in today’s global world.